FGC BOLSA - FGC FINANCIAL MARKETS INFO: How Far Will Square Stock Fall? How Far Will Square Stock Fall? Square, Inc. (SQ) shares fell more than 10% on Tuesday morning after Nomura analysts cut their price target from $125 to $107 per share, but the stock regained ground by the late morning. Nomura still believes that the fast-growing Cash App can co-exist with PayPal Holdings, Inc.'s (PYPL) Venmo over the long term and continue generating strong financial results. The move lower for Square follows a similar sell-off during Monday's session, when the stock fell nearly 10%. Fintech stocks have been under pressure along with the broader tech sector as investors reassess the companies' earnings potential over the coming year. Nomura increased its forecasts for Square for this year but lowered its forecast for next year from $508 million to $464 million in EBITDA. 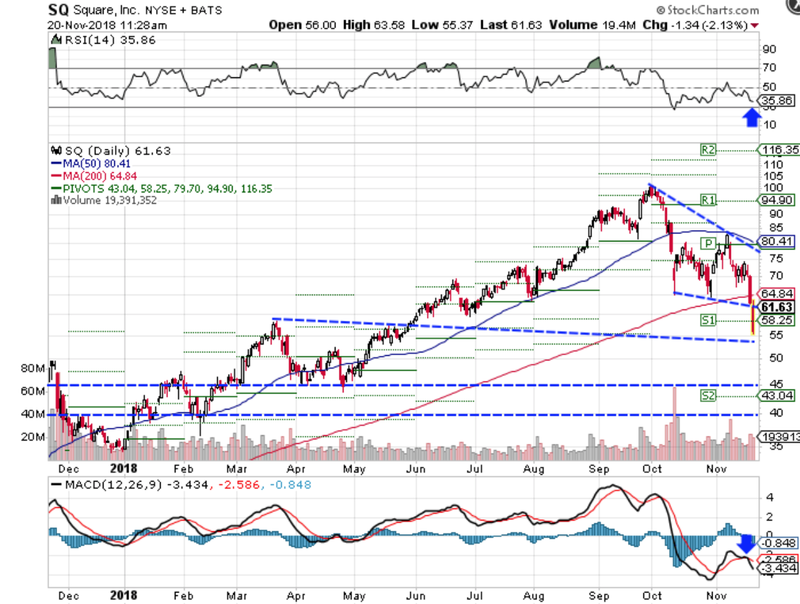 From a technical standpoint, Square stock broke down from trendline support and S1 support at $58.25 to around $55.00. The relative strength index (RSI) is approaching oversold levels at 35.86, but the moving average convergence divergence (MACD) experienced a bearish crossover. These indicators suggest that the stock could see some consolidation before moving lower. Traders should watch for some consolidation above $54.00 over the coming sessions. If the stock breaks down from trendline support at these levels, traders could see a move down to prior support at around $45.00, S2 support at $43.04 or trendline support at $40.00. If the stock rebounds back into its prior price channel, traders could see a move up to $75.00.